In 1519, when Hernn Corts led his army into Tenochtitlán in the Valley of Mexico, that Aztec city was the capital of a far-flung tributary empire. The emperor Motecuhzoma sat atop a complex social and political hierarchy, and the Aztec populace owed allegiance and tribute to nobles at several levels. Below the emperor were the kings of subject city-states. The Aztec dominion employed a policy of indirect rule, and imperial authorities supported local dynasties so long as they delivered their quarterly tribute payments on time. Officials recorded these payments in documents such as the Codex Mendoza [see "The Codex Mendoza," by Patricia Rieff Anawalt and Frances F. Berdan; Scientific American, June 1992]. Local nobles, who lived in both urban and rural areas, were subjects of their city-state king. At the bottom of the hierarchy were the commoners, whose tribute payments supported all these nobles. Aztec commoners must have had a heavy tribute obligation. How were they able to meet their payments? First of all, there were millions of commoners, so the tribute burden was spread over a large population. During the 1970s, surveys of patterns of settlement turned up the startling discovery that the Aztec period witnessed one of the major population explosions of antiquity. The number of people in the Valley of Mexico, the heartland of the Aztec Empire, increased from 175,000 in the early Aztec period (11501350 C.E.) to nearly one million in the late Aztec period (13501519 C.E.). Similar patterns of growth occurred in other parts of Aztec territory as well. The Aztec population explosion placed a heavy stress on the environment of central Mexico. New villages and towns sprung up everywhere, and all available land was cultivated, often at considerable labor expense. Wherever possible, farmers built dams and canals to irrigate cropland; they also built terraced stone walls on hillsides to make new fields; and they drained the swamps outside Tenochtitlán to create raised fields (chinampas), one of the most highly productive agricultural systems of the ancient world. These intensive farming practices transformed the central Mexican countryside into a managed landscape of cultivation. What were the effects of tribute extraction, population growth and agricultural intensification on the Aztec common people? Did these processes leave people impoverished and powerless, or did they allow commoners to prosper and thrive? Few of the available written accounts have information on conditions beyond the imperial capital, and thus it is up to archaeologists to study these questions. Until recently, no major archaeological excavations had been carried out at Aztec sites. Most Aztec cities and towns either were destroyed during the Spanish Conquest or were occupied and then buried under later settlements. The few surviving sites were small, unassuming peasant villages. Most archaeologists working in Mesoamerica bypassed Aztec sites on their way to the spectacular jungle ruins of Classic-period Maya civilization. Aztec sites were deemed either too difficult to excavate or too small to bother with. This neglect came to an abrupt end in 1978, when the Mexican government mounted an extensive excavation of the Great Temple of Tenochtitlán. Situated in the middle of Mexico City today, this magnificent structure, and the richness of the offerings associated with it, awakened a new interest in Aztec society. Unfortunately, these excavations did not provide much new information about the commoners or life in the provinces. To address these issues, my wife, Cynthia Heath-Smith, and I embarked on archaeological projects at rural and urban sites in the modern Mexican state of Morelos. Located just south of the Valley of Mexico, this was the first area outside the valley to be conquered when the Aztecs began their military expansion in the 1430s. We first excavated two rural sites--Capilco and Cuexcomate--southwest of the modern city of Cuernavaca. Later we turned to the Aztec city of Yautepec in north-central Morelos. By excavating the houses of both rich and poor, we have found that provincial society was far more complex than previously thought. Aztec peasants were not simple farmers whose lives were dominated by the need to pay tribute to their elite overlords. Commoners living in both rural and urban areas of the provinces made heavy use of a thriving marketing system. They exchanged craft goods produced in their homes for a variety of foreign goods, and most of this economic activity was accomplished outside imperial control and ignored by early writers on the Aztecs. ARCHAEOLOGISTS have found that excavations of houses and associated remains often provide the best data on ancient social and economic patterns. Capilco and Cuexcomate were good examples because traces of house walls were visible above the ground, and we did not have to waste time trying to find buried structures. Capilco was a village with 21 houses, and Cuexcomate a town with more than 150 structures, including temples, storehouses and ritual dumps. Houses at these sites were small (with a mean area of 15 square meters) and built of adobe brick walls supported on stone foundations. We excavated test pits in 29 houses selected at random. We then chose 10 of these for more complete clearing of architecture and associated deposits. These excavations allowed us to refine the Aztec chronology by splitting the late Aztec period into two subperiods--late Aztec A (13501440) and late Aztec B (14401519)--to yield a more detailed analysis. Capilco was founded by a few peasant families in the early Aztec period. The population explosion began in the late Aztec A period, when Cuexcomate was founded and both settlements grew rapidly. The residents of these communities could not support themselves using rainfall agriculture alone, so they had to intensify their agricultural practices. Farmers built terraces on slopes and in ravines to create additional, more productive plots in which they grew maize, beans and cotton. Houses at these sites were not packed very closely together, and open areas were probably devoted to farming. Cotton was an important crop in this part of the Aztec Empire, and household production of cotton textiles soon became the major craft. Every excavated house yielded large quantities of ceramic artifacts used in the hand spinning of cotton. Beadlike spindle whorls provided weights for the twirling wooden spindle, and small bowls with tripod supports were designed to control the spindle. Documentary sources state that all Aztec women, from the lowest slave to the highest noblewoman, spun and wove cloth. Cotton textiles had two economic functions beyond use as clothing. First, they were the most common item of tribute demanded by both city-states and the Aztec Empire. Second, they served as a form of money in the marketplaces, where they could be used to obtain a range of goods and services. In addition to textiles, some residents of these sites manufactured paper out of the bark of the wild fig tree, as attested to by "bark beaters" made of basalt. The Aztecs used paper to make books of picture-writing and to burn in ritual offerings. The many ceramic vessels used and discarded at each house were probably purchased in the marketplaces. Although local potters produced a full range of vessels, people often bought many decorated foreign pots. About 10 percent of all ceramic vessels excavated from these sites had been imported from the Valley of Mexico and other areas. These vessels did not have any functional superiority to the wares made locally, and people must have simply enjoyed using a variety of decorated serving bowls. In addition to ceramic vessels, people had other foreign goods in their homes. We recovered thousands of broken obsidian blades, whose closest geological source was 100 kilometers away. Obsidian blades, which had extremely sharp cutting edges, served in many household and craft activities. Needles and other items of bronze were imported from western Mexico. People obtained salt from the Valley of Mexico, where specialists extracted it by boiling and evaporating the saline lake water. Salt was transported in distinctive ceramic basins, and in every excavated house we found many shards of these vessels. The market system connected the inhabitants of these rural sites to the rest of the Aztec Empire and beyond. These excavations also revealed something of the noneconomic life of Aztec peasants. For example, every house contained a variety of incense burners and small ceramic figurines in the forms of humans and deities. These artifacts played a role in domestic rituals, which focused on purification and curing. Such ceremonies complemented the more spectacular public celebrations that took place at the towering temple pyramids in the larger cities and towns. Early Spanish priests described in detail the Aztec public religion, and excavation of the Great Temple has shown where these activities occurred. Before the recent excavations of houses, however, scholars had no idea of the nature of domestic rituals. Not surprisingly, the larger town of Cuexcomate was a more complex community than Capilco. The town was laid out around a public plaza with a small temple pyramid on its east side. Across the plaza from the temple was a distinctive residential compound that, at 540 square meters, was significantly larger than the other houses. Its rooms were elevated above ground level by stone platforms. The compound employed finer construction materials and methods than most houses, including ample use of lime plaster. These features, combined with a floor plan that corresponds to the layout of Aztec palaces, led us to conclude that the compound was the residence of a noble household. The artifacts left by the nobles who lived in this compound differed in quantity but not in kind from the artifacts found in the dwellings of commoners. For example, this structure yielded significantly greater numbers of imported and decorated ceramics than did the commoners houses, as one might expect. Nevertheless, nobles did not have exclusive use of any category of artifact. We uncovered the most costly imported goods, such as polychrome bowls from the religious center of Cholula, bronze objects and jade jewelry, at both common and noble residences, showing that both groups had ready access to the extensive Aztec marketing system of central Mexico. The conquest of this region by the Aztec Empire around 1440 ushered in the late Aztec B period. Soon after, the nobles compound at Cuexcomate was abandoned, and a new, smaller elite compound was built on the north side of the plaza. Populations continued to grow; Cuexcomate expanded from 200 to 800 persons, and Capilco grew from 35 to 135 persons in the late Aztec B period. Agricultural workers constructed extensive terracing to keep up with population growth, but farming reached a point of diminishing returns as all available land was terraced. Artifacts and architecture provide clues to ancient standards of living, and evidence at these sites points to a significant decline between periods A and B. For example, nobles as well as commoners had fewer imported goods and fewer decorated ceramic vessels in the later period. Wealth indices, which we calculated from the quantities of valuable artifacts found at each house, showed a consistent decline. Some commoners tried to compensate for their economic difficulties by increasing their production of textiles. At each site, the houses with the most cotton spinning artifacts were the ones with the lowest wealth indices. In other words, the poorest households put the greatest efforts into craft production, probably to compensate for low crop yields or a lack of land. This pattern has occurred in many parts of the world when overpopulation and land scarcity have led to a declining standard of living. TO ROUND OUT our study of provincial life, we turned to Yautepec, the capital of a powerful city-state in Aztec times. Former Aztec cities in central Mexico are still occupied today, with the ancient ruins buried under layers of historical and more modern settlement. The early Spaniards built Christian churches on top of the remains of Aztec pyramids and placed their own towns over the Aztec cities. In this respect, Yautepec is unusual. There the Spanish settlement covered only part of the city. In 1989 Hortensia de Vega led a team of archaeologists from Mexico's National Anthropology Institute in the excavation of a large mound at the edge of modern Yautepec. This mound turned out to be the ruin of the royal palace of Yautepec. It is one of the few Aztec palaces to be extensively excavated. We were invited to join the work at Yautepec to study houses from other parts of the ancient city. At that time, very little was known about Aztec cities except for Tenochtitlán. Although archaeologists had collected surface artifacts from cities in the Valley of Mexico, no one had excavated any urban Aztec houses. The first field season, in 1992, we devoted to a surface survey that established the size and extent of the Aztec settlement. Even within the modern town it was not difficult to trace the extent of ancient Yautepec, which covered just over two square kilometers. In 1993 we returned to excavate houses. We began by digging test pits in open fields and vacant lots and succeeded in locating and uncovering seven houses and their yard areas. The Yautepec excavations encountered quite dense concentrations of artifacts, and in six months of fieldwork, we recovered 1.2 million potsherds and nearly 50,000 obsidian artifacts, mainly blades and other tools. Our results have revealed some fascinating similarities and differences with respect to the earlier findings at Cuexcomate and Capilco. Of the seven houses excavated at Yautepec, five were small dwellings of commoners, which had an average size of 26 square meters. Like their rural counterparts, the houses were built of adobe bricks placed on foundation walls of stone cobbles. We also excavated an elite residence that was much larger (430 square meters) than the common houses and made greater use of lime plaster and dressed stone masonry. Another house was a poorly preserved structure of intermediate size (80 square meters) whose class affiliation is not clear. Yautepec commoners, like their country cousins at Capilco and Cuexcomate, had ready access to foreign goods. The same kinds of imported ceramics, obsidian, salt, jade and bronze were found in residences at Yautepec. Chemical evaluation using instrumental neutron-activation analysis (at the University of Missouri Research Reactor Center) confirmed our initial interpretations of the local and imported origins of various types of ceramics. We learned that vessels of the well-known type "Aztec III black-on-orange" were imported from at least four different workshop areas in the Valley of Mexico. Ninety percent of the obsidian artifacts have a distinctive green tint that identifies their place of origin as the Pachuca geological source area, north of the Valley of Mexico. The remaining 10 percent of obsidian tools--as determined by x-ray fluorescence studies at the University at Albany--came from at least 10 other geological sources scattered throughout central Mexico. For whatever reason, the people who lived in the houses excavated at Yautepec all used obsidian tools from five different geological sources. One set of analyses we have completed illuminates the origins of the bronze artifacts. Dorothy Hosler of the Massachusetts Institute of Technology analyzed the chemical composition, design and metallurgical properties of metal artifacts from all three of the sites. These objects include sewing needles, awls, bells and tweezers, all composed of copper-tin- or copper-arsenic- bronze alloys. Morelos was not a metal-producing zone in ancient times, and these artifacts closely resemble the bronze artifacts made in the Tarascan Empire of western Mexico. Hosler has completed the first application of lead isotope analysis to ancient Mesoamerican metallurgy by sampling ore sources in several areas and artifacts from a variety of sites, including Yautepec. A number of the Yautepec bronze objects match ore samples from the Tarascan territory. Although written sources report that the Aztecs and Tarascans were constantly at war, the excavations nonetheless provide clear evidence that Tarascan bronze and obsidian were traded across the border and that they made their way into the homes of provincial commoners through the Aztec marketing system. YAUTEPEC, unlike the rural sites, had numerous craft industries in addition to domestic textile production. Several households made obsidian blades, and a few excavations uncovered evidence of the production of lip plugs, earplugs and other obsidian jewelry. We also recovered molds used to make ceramic spindle whorls and figurines. Although these molds are not abundant, they were found in many different excavations at Yautepec. Bark beaters for the manufacture of paper were also present. At this point, it appears that many of the common households at Yautepec produced various craft items in addition to cotton textiles. What do these excavations tell us about the people who lived in the provinces of the Aztec Empire? The overall impression is that provincial commoners were relatively prosperous, enterprising people. In spite of an economic decline after conquest and incorporation into the Aztec Empire, commoners in both urban and rural settings still enjoyed access to a wide range of imported goods. These goods were obtained through the markets. Both documentary and archaeological data indicate that the Aztec market system operated largely outside state control. The markets connected people in even the smallest peasant villages with the larger informal Aztec economy of central Mexico. Family members engaged in a variety of craft activities to produce goods to sell in the markets. At sites in Morelos, the most important of these products were cotton textiles manufactured by women in their homes. Written sources tell us that Aztec commoners were subject to nobles, who owned most of the land and monopolized power within the city-states. Archaeological excavations suggest that at least in several provincial settlements, this burden was not excessive. There is no evidence to suggest that nobles controlled craft production or exchange. The people in the provinces managed to achieve a degree of economic success through channels unconnected to the state and unreported in the official histories of the Aztecs. Illuminating the lives of these previously invisible people is one of the rewards of being an archaeologist today. MICHAEL E. SMITH is a professor in the department of anthropology at the University at Albany, New York. Born in the Philippine Islands, he received his undergraduate degree from Brandeis University and, in 1983, his doctorate in anthropology from the University of Illinois. Before joining the faculty at the University at Albany, Smith taught at Loyola University in Chicago. His research focuses on the archaeology and ethnohistory of postclassic central Mexico. 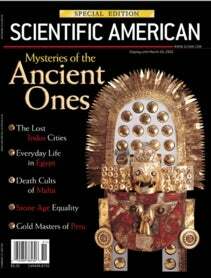 The excavations described in this article were funded principally by the National Science Foundation and the National Endowment for the Humanities.